Original Article: "The best seafood restaurants in Chicago"
The Midwest wasn’t always such a great spot for seafood, but these days, it’s plenty easy to ship fresh oceanic treasures straight from the coasts. Add in some of the best chefs in the country, and it’s not hard to see why Chicago is rife with excellent seafood restaurants that serve slurpable oysters, pristine tuna tartare, buttery lobster rolls and crab legs by the pound. Better yet, there’s something for every budget—from quick-service lunch in the Loop to splurge-worthy steakhouses. Check out the 16 best seafood restaurants in Chicago. Our go-to spot for seafood, Shaw’s Crab House is a Chicago classic.Choose from two seating experiences: the traditional white-tablecloth–equipped dining room or the lively oyster bar, where you’ll find us sucking down bivalves, cracking open crab claws and dunking lobster tails in butter. The menu also includes a terrific lobster roll, bound up with the barest hint of mayo, and sushi and sashimi. Pair your seafood feast with a local beer or a classic martini, which goes perfectly with oysters. You should feel like a king when you’re paying through the nose for a steakhouse experience, and you will here. Start with the sweet, cool stone crabs, the sugar prawns (Madagascar shrimp) and a delicious chopped salad that could easily feed two. Go straight to the top with the bone-in ribeye, perfect when ordered charred medium-rare, or the Alaskan king crab legs served chilled. Key lime pie is puckeringly sweet for those who like a hit-you-over-the-head finish, and brunch-only fried chicken is the best secret in town. Though its name may be goofy, Oyster Bah is serious about seafood. 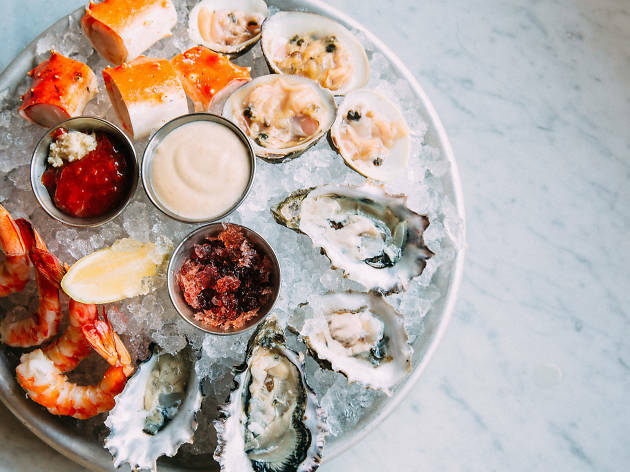 The Lincoln Park restaurant offers eight to 12 varieties of East and West Coast oysters daily at $3.50 a pop (enjoy select half-priced bivalves from 5 to 6pm daily). If oysters aren’t your jam, the menu is packed with alternatives, including sizzling garlic shrimp, grilled Spanish octopus, hearty clam chowder and grilled trout with poblano salsa verde. You’ll need to book a repeat visit to check out Crab Cellar, the basement concept that serves endless Alaskan king crab legs and prime burgers for $69.95 per person.